Take a photo at Double H? Share it with us! My brothers and I were given the opportunity of being able to go to Double HH siblings week for the past three years and I wouldn’t want anything different. I have made life long friends and I consider them my family. HH is my family and everyone treats each other with love, support, acceptance, and if someone has a disability it disappears at HH because we look beyond that and I love it so much. I’ve taken a strong interest in ASL, and working in special education because I want to help people. I’m thinking about becoming a counselor during the summer because HH is home, its a safe place for me and I don’t want to lose that feeling of happiness. I lost my mother to AIDS when I was just 7 years old. I was confused and a lost child, trying to understand and find answers. “Why her? Why me? What is “AIDS”? What is “HIV”? How can it be cured?”. I started camp shortly after and eventually received the best answers I could of got. I spend the rest of my childhood, growing into who I am today, at this wonderful place. When I was away from camp, I didn’t feel like I “fit in” anywhere else, but the moment those bus doors opened and we were greeted by our counselors, it felt like home. It felt right. The next decade I spent 1 week of my summer here, and always begged for more time. The boat ceremony was always the hardest. So many tears were shed that night, but we all were hopeful. Hopeful we all were able to make it back the following year. Some didn’t, but most did. I haven’t been back to camp in a decade now. I miss it so much. There is plenty of times when I just sit and think about it, and dreamed of coming back one day as a counselor, or just a visit. I now have my own 7 year old beautiful healthy little girl that calls me mommy. I take what I learned at camp with me through every day parenting. Never to judge others, always be kind, have courage in everything you do, and to never give up. Double H Ranch is my home away from home, and I cherish it so deeply. I even have it tattooed on me! If anyone is looking into bringing your child here, do it. You wont regret it, and they won’t ever stop sharing the memories with you that they had there. I’m turning 28 years old this year, and I feel amazing. Beating odds is an amazing feeling, but not thinking about turning 30 soon is!! Haha! I want to say a huge thank you to all of the counselors because without all of your encouragement and love, we may not of pushed ourselves to try harder. So thank you all!! This is the story of the time I had the best summer ever. Double H is the top best camp I’ve ever been to. All the camps that I have been to they let us do work, only went places that they picked out, and we never had any fun time. Until me and my mom went to the Valerie Fund Center, and we found out out Double H. The first time I went there, I got a little homesick. But, when we showed up at Double H I felt welcomed. People were cheering us on, I didn’t have a clue why, and they gave us hugs. I can definitely say that for the past 4 years that I have been at Double H, they have treated me like family, and I really love that about this camp. So I want to say thank you to the Valerie Fund Center, thanks to Double H, and thanks to my mom cause without her I don’t know where I would be. And This is the story of the time I had the best summer ever. When I was a child, I started going to Double H. I spent 9 years as a camper there. The freedom that I experienced, and the feeling of “fitting in” as a little boy with Spina Bifida was profound on me. When I was a camper at Double H, I looked up greatly to my counselors, and the positive impact that they had, not only on me, but everyone else there. It has inspired me to this day. Now, I volunteer with another organization with their camping program as the camp director, and I still look back to my counselors that I had when I was younger for inspiration on fun ways of interacting with my campers who have their own special circumstances. 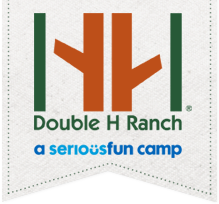 Double H Ranch not only gave me the freedom as a little boy to be confident in myself, but it carries with me to this day in leading camping trips with youth who have disabilities. The spirit of camp is something I can never let go. I just wanted to drop you all a quick note to say thanks for all that you did to make our recent camp (Cindy’s Comfort Camp) such a great success. This was the biggest and best group of Double H staff and volunteers that we had at any of our camps. All the Double H staff, Double H big Buddies, and Double H volunteers not only worked tirelessly to get to know the kids and deliver the program, they also made sure that our campers benefited from the uniquely special spirit of the Summer program. It made such a positive impact on the weekend and the kids. I hope that we are as fortunate in future camps to be able to benefit in this way. Our partnership is so meaningful to me, and it makes me happy and proud to see how it is blossoming. I hope too that we are able to give more volunteers to your other programs. I have some ideas about how to get more people involved. Again, thanks so much. I look forward to seeing you all over the Winter, in the Spring, and in the Summer. I guess I’m like a bad penny now, I keep turning up!